This is little Lila, she’s a 6 month old ladycat who my friend Arianna found living rough in their neighbour’s coal cellar. 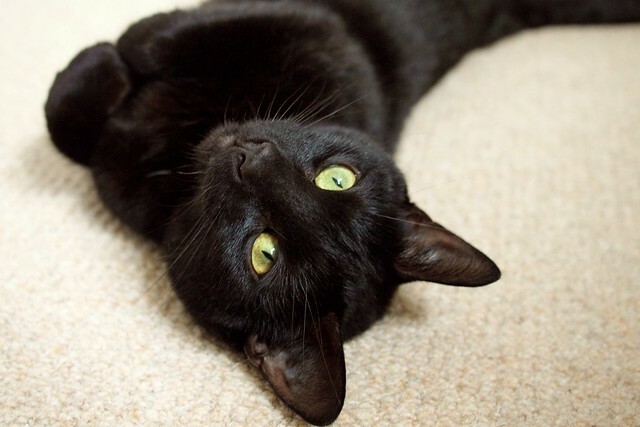 They’d been hearing her for a month or two but couldn’t track her down – well, black cat in a coal cellar – but eventually brought her in after they found her sleeping on their doorstep. We aren’t sure if she was born stray or ran away, but no one has claimed her after advertising, so we made the decision to give her a new home (Arianna already has four cats so couldn’t keep her!). We named her Lila (lee-la) after her gorgeous green lilypad eyes. 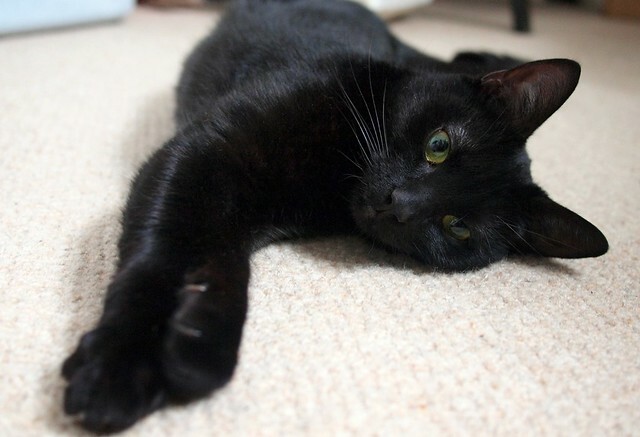 Given her rough start in life she’s totally healthy, so incredibly friendly and loves to be around people – her lovely purrr is near-constant when you walk in the room and she loves snuggles. She’s currently settling into one of our spare rooms to get acclimatised to her new home. We’ve yet to introduce her to the alpha-male of the family, who I’m not sure will be thrilled to become a big brother but has been surprisingly cool about the new arrival so far. I’ll be sure to keep you posted with pics and how she’s settling in. I’m glad you gave her a nice home, it’s so nice to read about people helping strays instead of just ignoring them.. and I love the name too! She’s gorgeous! She looks like such a sook too, how sweet. omg. SO ADORABLE. Her little paws in the pictures where she’s lying on her back!! Ah, cats. Can’t wait to see more photos. Lila is a delight – so pretty! Aww what a cutie! How could you resisted her, really? 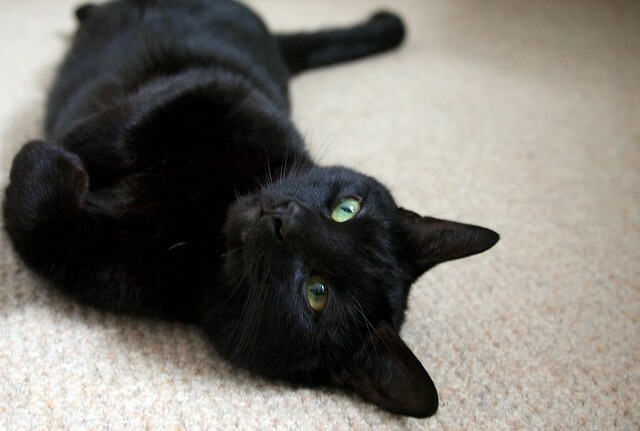 oh I love black cats, they are so beautiful. Did you check for a microchip ? I only ask as I always hope I will get my missing cat back via her microchip information. Ah so pretty! I am incredibly envious. She’s a beautiful cat. You’re so lucky you can have cats. I don’t have a garden so I can’t have any, so have to be satisfied looking at cute photos of other people’s. She’s beautiful Katie and she certainly looks like she’s loving her new life with you. 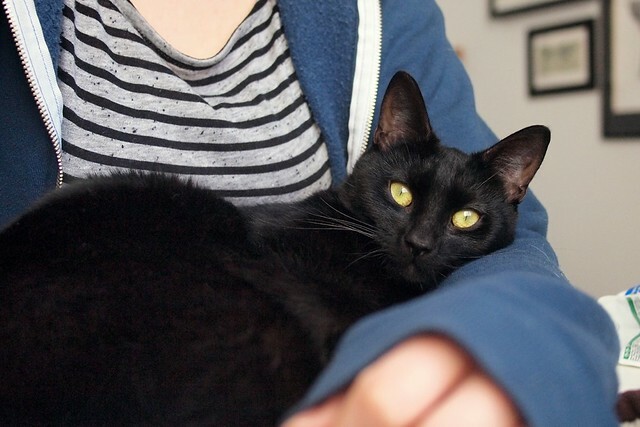 But she seems like she’s been handled before, usually stray borns are nervous of human contact – how lovely you’ve homed her, she’s gorgeous, makes me broody for another but I also have an alpha male, so I’ll be curious to see how yours get on. That’s true! I think she’s just happy to be somewhere warm with someone feeding her. Oh she is absolutely gorgeous!!! She seems really relaxed and happy in her new home already! 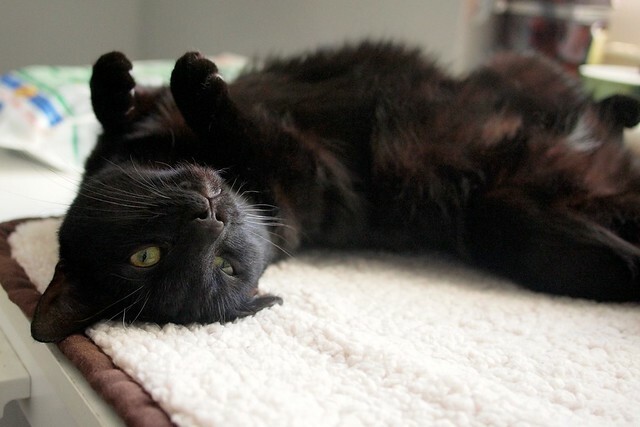 So many little black cats are abandoned and never re-homed because people are superstitious about them or don’t find them as cute as other breeds. 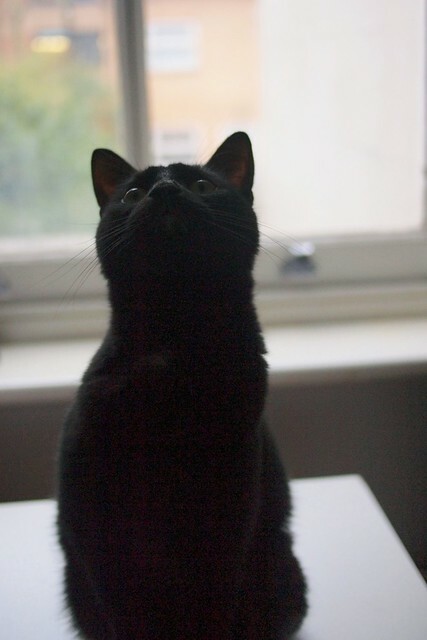 It’s such a shame and it’s why there is such a thing as Black Cat Awareness Week. Oh my, what gorgeous cats! 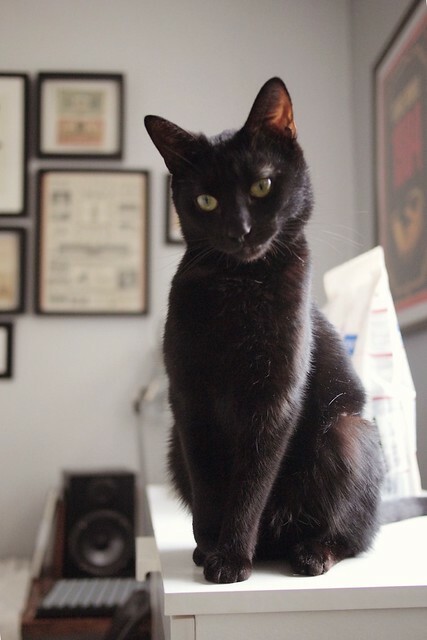 I love black cats, and the other one’s beautiful, too! Too lovely! She looks so happy in her new home. She looks like such a sweetie, and is so cute. Glad to hear she was rescued and that you took her in. I love a cat rescue story – I’m such a sap for that kind of thing. 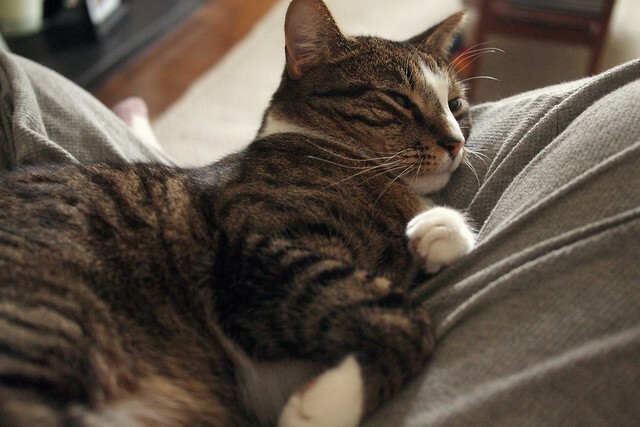 What a beautiful cat she is, and so amazing that she is a happy and content people cat too – she looks so at home with you already. I spotted a few of your ‘cat in cage v cat on chair’ pics on twitter. I hope they’ll become friends. Mine pretend to not really like each other but as time goes on they seem to forget themselves and we catch them playing and occasionally washing each other. sweet.